A common waxcap of cropped pasture and parkland, like nearly all waxcaps Hygrocybe chlorophana is an autumn and early winter species. These lovely golden fungi are generally found in small trooping groups; they are sometimes seen in churchyards, but sheep-grazed upland commons are usually much better places to try. Golden Waxcaps are all too easily confused with other yellow waxcap species. Restricted to the increasingly scarce habitat of unimproved grassland, Hygrocybe chlorophana is an infrequent but far from rare species in Britain and Ireland, and it occurs also in parts of mainland Europe. In Germany, Poland and Switzerland this waxcap is included on the Red List of threatened species. 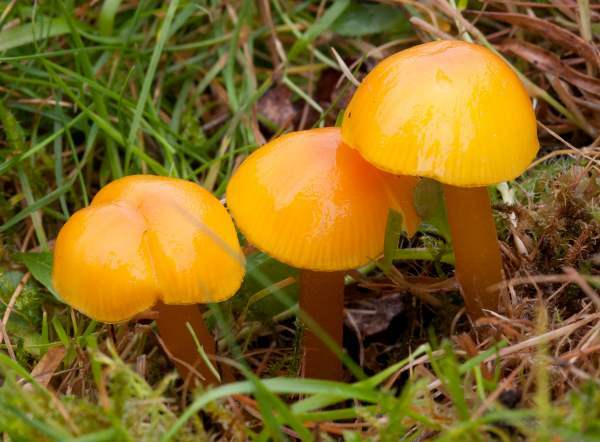 The Golden Waxcap occurs also in some parts of the USA, where it is mainly a woodland mushroom. This lovely waxcap was first described in 1821 by Elias Magnus Fries, who named it Agaricus chlorophanus - Most of the gilled mushrooms were included initially in the genus Agaricus! In 1877 a German mycologist, Friedrich Otto Wünsche (1839 - 1905), transferred this species to its present genus. 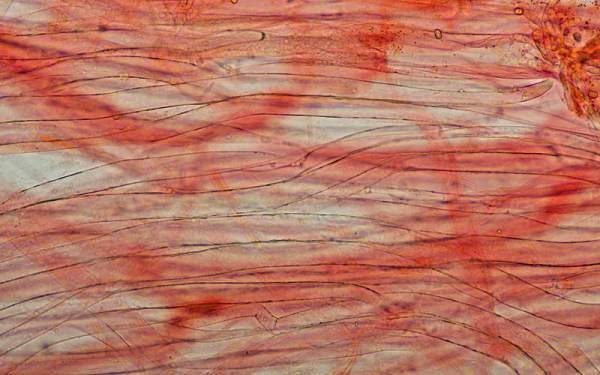 Other synonyms of Hygrocybe chlorophana include Hygrocybe euroflavescens Kühner, Bull., Hygrophorus euroflavescens (Kühner) Dennis, Hygrophorus chlorophanus (Fr.) Fr., and Hygrocybe flavescens. 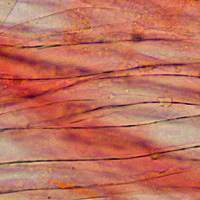 The genus Hygrocybe is so named because fungi in this group are always very moist. Hygrocybe means 'watery head'. 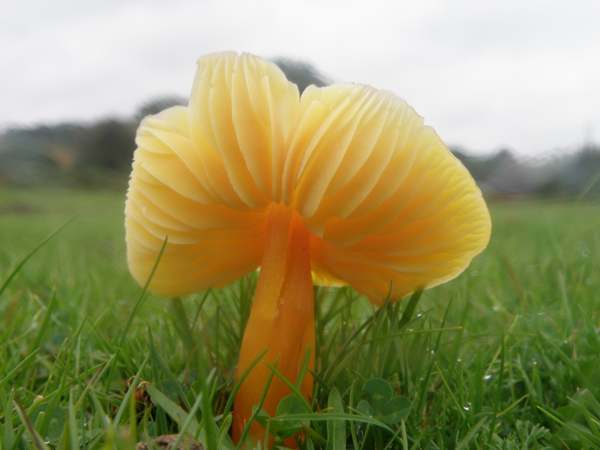 The specific epithet chlorophana is something of a misnomer, because it translates to pale green whereas this particular waxcap is predominantly yellow, orange or somewhere between these two. Golden seems a most appropriate description for these grassland fungi - certainly for those that I have come across in Britain, Ireland and a few locations on mainland Europe. 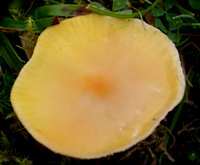 The cap of Hygrocybe chlorophana, initially domed, is yellow with sometimes an orange or very occasionally a red tinge most noticeably towards the centre. The cap is very slimy in wet weather; it becomes broadly umbonate or even flat with age and grows to between 2 and 4cm in diameter. 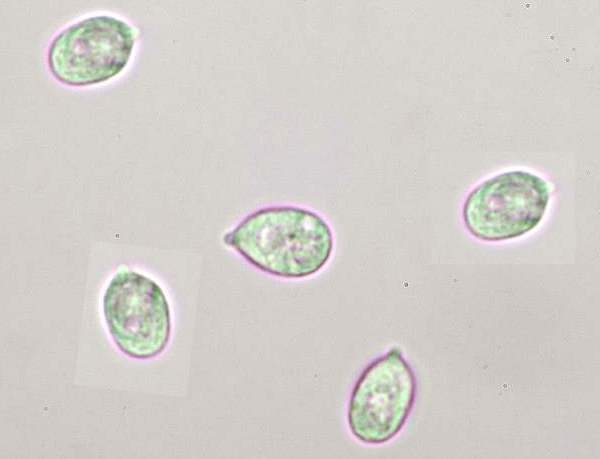 The thin cap flesh is yellow. This grassland waxcap does not blacken either with age or when bruised. Yellow, becoming a paler lemon-yellow as the fruitbody ages, the gills are adnate, broad and fairly distant. 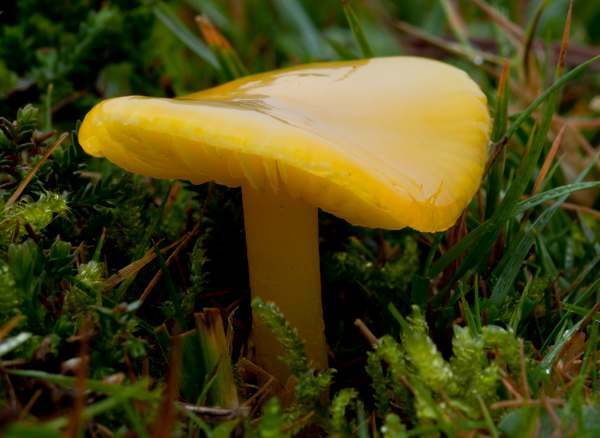 Coloured as the cap, the slender stem (typically 2 to 3mm diameter) is viscid and has no ring; its flesh is yellowish and solid. Ellipsoidal, smooth, some with constrictions or with one side concave (almost kidney-shaped), 7-8.5 x 4-5μm; inamyloid. The Q value (length to width ratio) varies considerably but is typically 1.5 to 1.9. 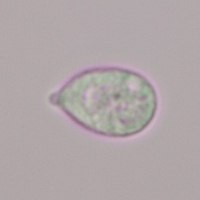 Regular, with narrow elements up to 1mm or more in length. 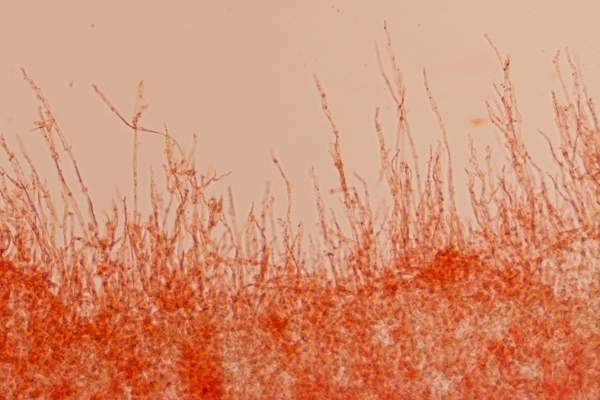 An ixotrichoderm - the outermost hyphae emerge roughly parallel, like hairs, perpendicular to the cap surface, and the prefix ixo- indicates that the outermost hyphae are gelatinous. 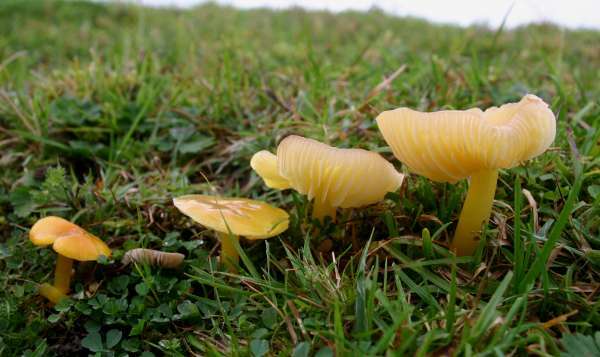 Golden Waxcaps appear most commonly on closely cropped or mown grassland where artificial fertilisers are not spread. 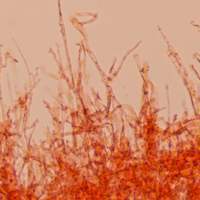 Waxcaps have long been considered to be saprobic on the dead roots of grasses and oter grassland plants, but it is now considered likely that there is some kind of mutual relationship between waxcaps and mosses. Late summer and autumn in Britain and Ireland. 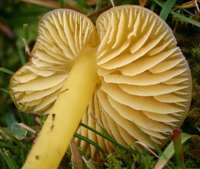 Hygrocybe ceracea is similar but noticeably drier and usually smaller, with adnate or even very slightly decurrent gills; its stem becomes hollow with age. Hygrocybe glutinipes is similar in form and colour, but it is typically smaller and as the specific epithet suggests it has a glutinous cap and stem. Although reported in many field guides to be edible (albeit of only mediocre flavour) Golden Waxcaps are easily confused with other inedible and possibly suspect yellow waxcap mushrooms. Their flesh is insubstantial, and therefore these fungi are not generally considered worth collecting for the pot.